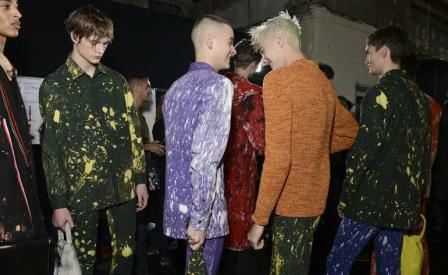 In a delirious triumph of artistic symbiosis, the American artist Sterling Ruby joined forces with Raf Simons for an electric menswear show for A/W14 that combined their fundamental anarchies in a collection bursting with violent and colourful promise. As an avid collector of Ruby's work and a firm friend, Simons levelled the postmodern playing field like never before in this 50/50 collaboration that saw his archetypal silhouettes become a new canvas for emotional expression. In an acid rainbow of cropped or cocooning parkas, sweatshirts and bleached denim (teetering on Buffalo-style biohazard boots) Ruby's graphic and typographic icons appeared in myriad appliqués - from urgent, striped collages to lettered bomber cuffs. Words like 'Fathers' appeared in a tribute to their own parents (both ex-military men) and 'Crypt' returned from Ruby's previous works, while 'Abus Lang' abbreviated 'abusive language'. Packaged as either art or fashion, the garments felt accessible and seductive, while the set design arched above us all, in four spongy gateways of stars and stripes - a nod to Ruby's Vampire series and his largest soft works to date.